Games Official: Warhammer 40,000 Space Marines was released earlier in the month of September this year, as it was expected that the game is yet a step forward for Relic Entertainment in the field of outer space-alien-battle action. 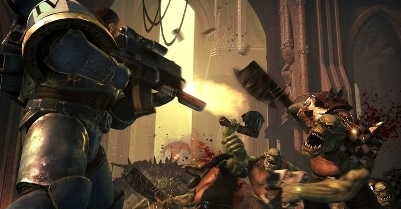 Overall Warhammer 40K was given an above average rating, specifically taking the global audience into consideration. To start with, the game developer has done exceptional work in creating this game, especially the storyline. It is very enjoyable whatever it may be, but there could be exceptions if you had a bad experience with the previous release. If you are looking to go for this game as a first timer, it is advisable that 40K is the right version to start with, thanks to the eligible storyline it contains. The game is yet another third person action adventure where a space marine called Captain Titus, along with a few marines who call themselves ‘Ultramarines’, are sent to an unknown planet that is infested by millions of Orks. They have to test their ability to live along with a handful of Ultramarines in a strange world; yes this is not a storyline which is fresh out of the box. As the game proceeds, there is tragedy, betrayal and a lot of unexpected twists which provides you with a temporary moment of a hair-raising experience. But as it is known, there are several other games that have been built on the same sort of storyline, so what makes the difference here is the sole reason it has been rated just above average. Captain Titus is not just another space marine, he is a superhuman capable enough to turn an entire legion of ugly aliens into a corpses. There are a number of weapons that one can choose from – guns to firearms, battle axes and swords, perfect to turn a fight into a gory bloodbath frenzy. Speaking of weapons, you can consistently get rid or pick up a number of varied weapons on different stages of the game, so that you have an option to upgrade your artillery. The melee combats are not confusing or hard at all, it’s comfortable, understandable and easy to tackle; makes the scenario more playable. There are some flaws that Relic hasn’t worked on, like the game lacks the punch of providing the player with enough fights, especially in the early levels; later on it does get better. To conclude, there are several reasons that ask you to keep this game in your safe, for the reason there is a multiplayer option and the fun and excitement can be doubled. Animation continuity is a complaint, a number of times it leaves the players lost, but it once you get a hang of it, it does get enjoyable from start to finish. Relic Entertainment has been working on the 40K for some time now, and not to mention, the weird response it got from the previous releases, its efforts have finally been proven. Everyone is not a Warhammer fan, but if you haven’t played on something like Halo or any other space battle game, then 40K should be a stepping stone for you. Next articleHas anything really evolved in Pro Evolution Soccer 2012 ?